EL CAJON (2-24-17) — Grossmont College’s TREVOR BEARD slashed a 3-run homer to left field in the bottom of the 7th to give the Griffins a 7-6 lead over visiting Irvine Valley College on Thursday (Feb. 23), and then held on to clip the Anteaters 10-7. The Griffins took a 3-1 lead in the second inning as MICHAEL DIFFLEY doubled to left center and advanced to third on an error by the left fielder for two RBI. CABOT VAN TIL doubled down the left field line in the same inning and Diffley scored. Irvine Valley added a run on a bunt single in the 4th. The Anteaters fought back to make it 6-4 after six innings. 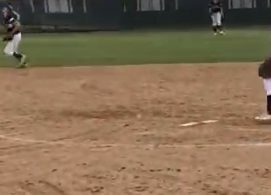 In the 8th inning, JUSTEN BURKEY ripped a single to left field to drive in the winning markers after Irvine Valley had scored to the the game at 7-all in the top of the inning. TIM HOLDGRAFER earned the win with 2 1/3 innnings of work, allowing a run and striking out three. JAVIER DE LA TORRE got the save with a perfect ninth. R. Rafferty grounded out to ss, RBI; T. Odekirk scored. M. Diffley doubled to left center, advanced to third on an error by lf, 2 RBI; J. Burkey scored; N. Navarro scored. C. Til doubled down the lf line, RBI; T. Beard advanced to third; M. Diffley scored. C. Conroy singled, bunt, RBI; T. Wagner scored. A. Ceniceros singled down the rf line, 2 RBI; R. Gaynor advanced to third; Z. Stack scored; T. Odekirk scored. T. Wagner reached first on an error by 1b, RBI; A. Ceniceros advanced to second; R. Gaynor scored. T. Odekirk singled to right field, RBI; C. Conroy scored. T. Beard homered to left field, 3 RBI; N. Navarro scored; N. Strohl scored. R. Gaynor singled through the left side, RBI; T. Odekirk scored. J. Burkey singled to left field, 2 RBI; E. la advanced to third; R. Bostedt scored; R. Hernandez scored. M. Diffley singled to center field, RBI; J. Burkey advanced to second; E. la scored.